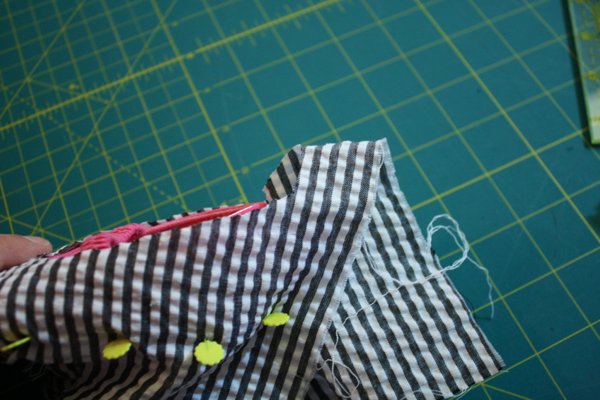 To make my boots and cape, I first needed patterns. 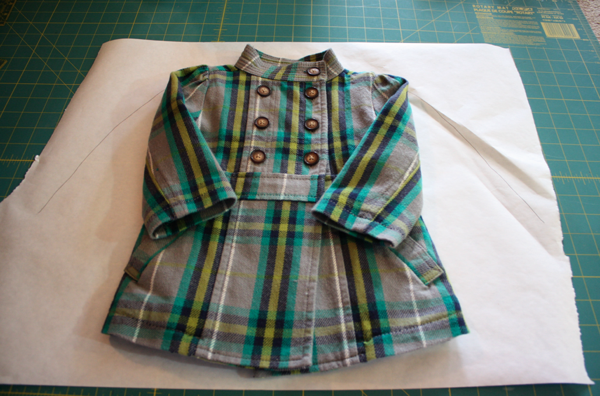 I used existing pieces of clothing Chloe owns to make them both! 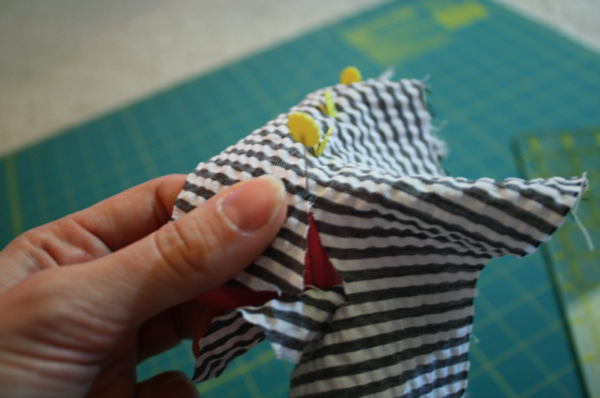 I use freezer paper to make all my patterns. I started with the boots. 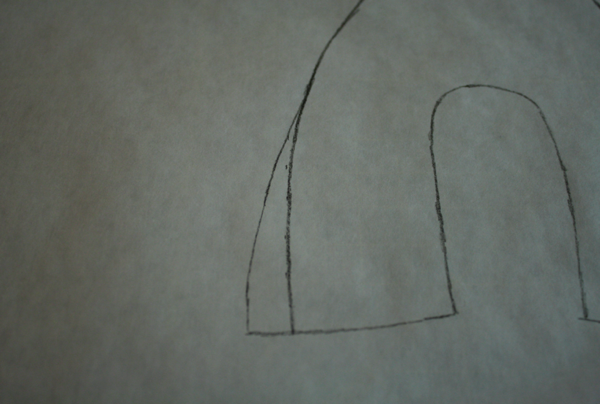 I traced a crib shoe we have that is her size, then I drew another line 1/4″ from the line I traced to add in seam allowance to the sole of my shoe. 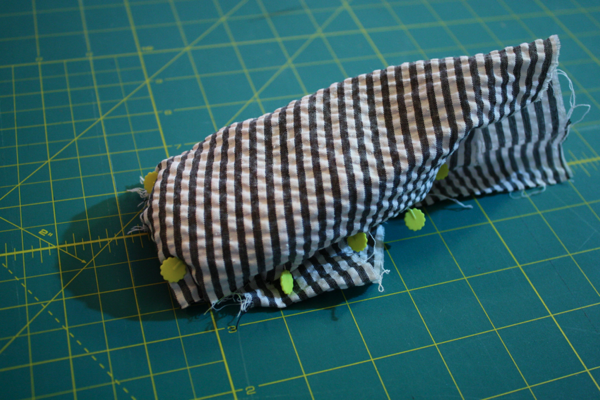 Then to make the upper, I grabbed a piece of scrap fabric that was a sizeable amount bigger than my shoe. 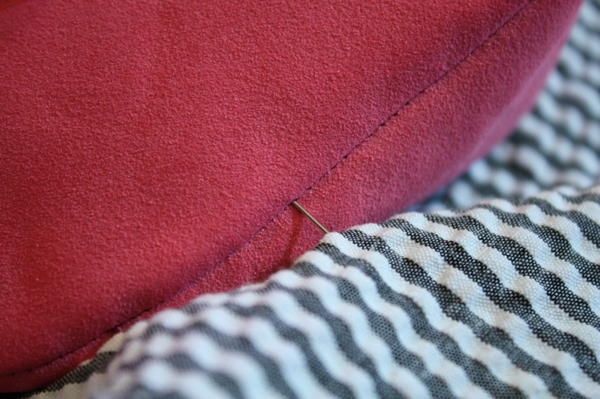 I laid the scrap fabric on top of my shoe, and using straight pins, I pinned in the bottom seam of the shoe around the perimeter, smoothing the fabric as I went. 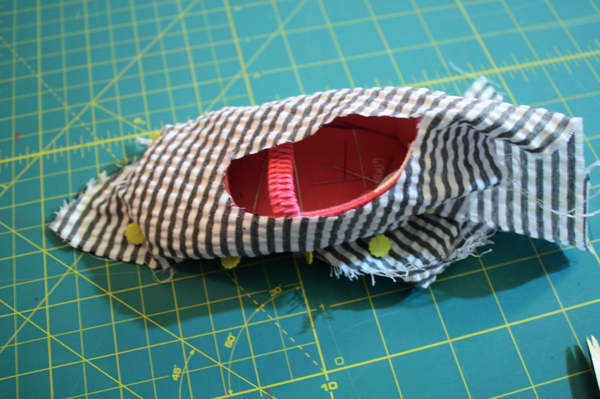 When I got to the seam up the back of the shoe, I left the fabric open. 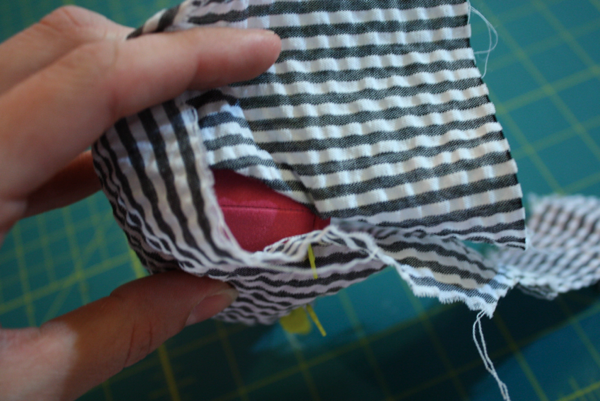 Then VERY CAREFULLY, I cut a slit in the top of the fabric the length of the shoe opening. 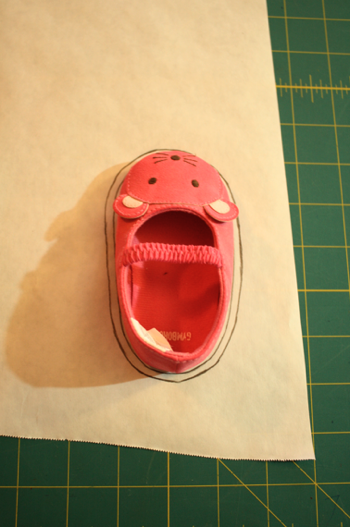 Because of the shape of the shoe, there will be extra fabric at the back. 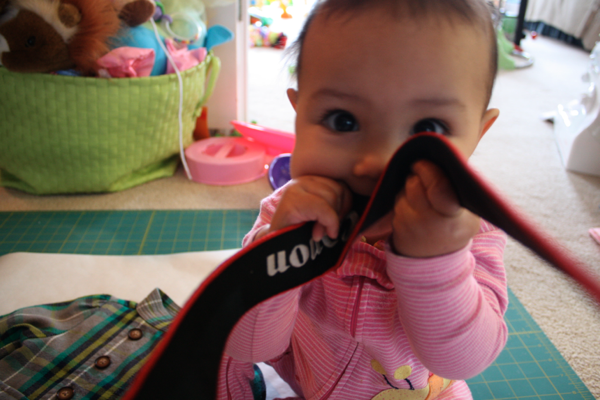 Simply pinch it together, and cut it off even with the back of the shoe. 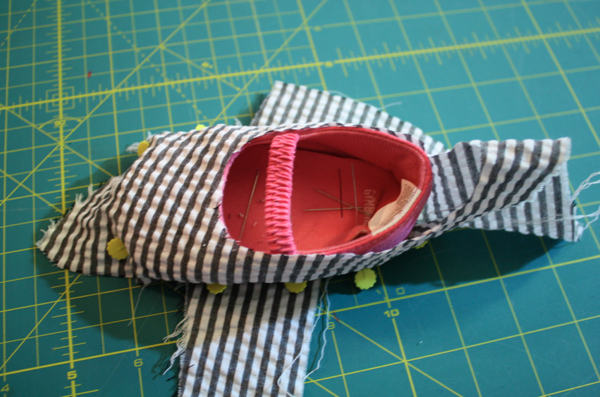 Then cut away the extra fabric so it matches up with the seam in the shoe. 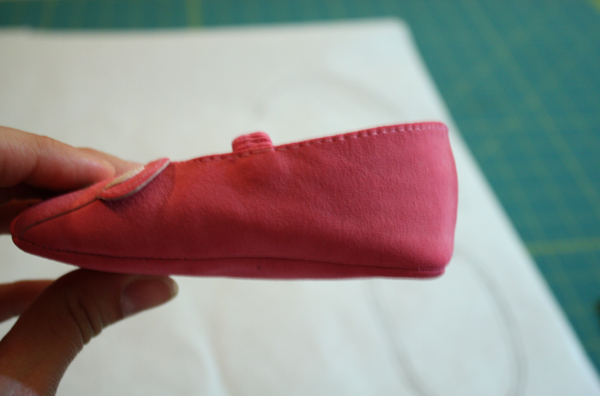 Then to cut away the bottom part, start at the back seam and work your way around the shoe, cutting with your scissors lined up with the seam around the bottom, and cut from pin to pin. 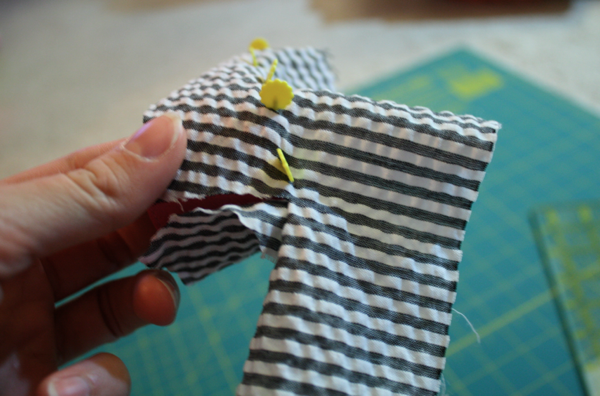 Once you get all the way back around, you will have cut off all the excess fabric, leaving only your shoe upper pattern piece. 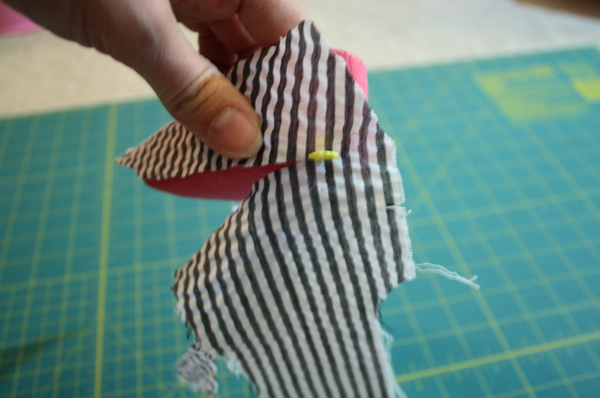 Lay your pattern piece down on your paper and draw around it 1/4″ from the edge for seam allowance. 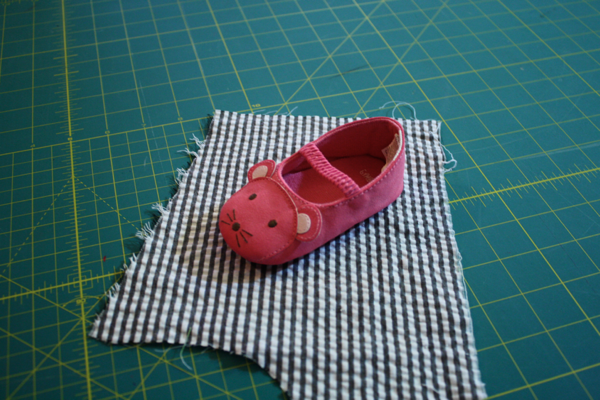 Now, if we were making a regular crib shoe, this pattern piece would be perfect. But since we’re making boots and the tall part of them needs to be 1 height, we need to get rid of the extra created by the angle in the shoe. 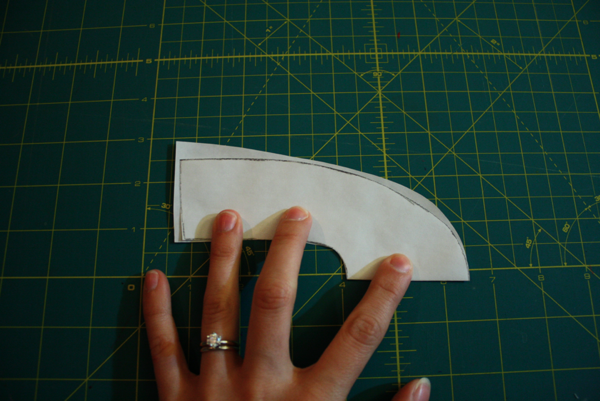 I measured just in front of the elastic and got 1.5″. 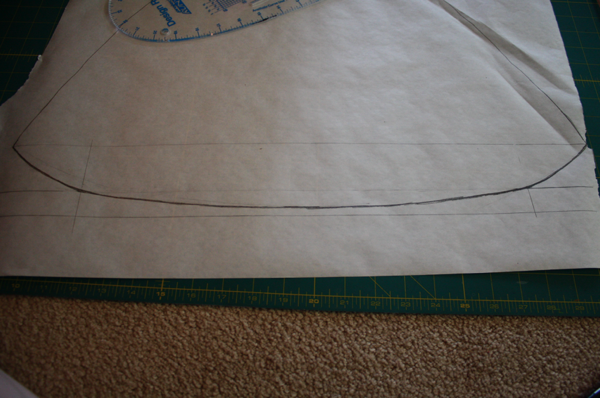 So I found 1.5″ on my pattern piece, and measuring from the inside, marked at 1.5″ down to the back of the shoe. 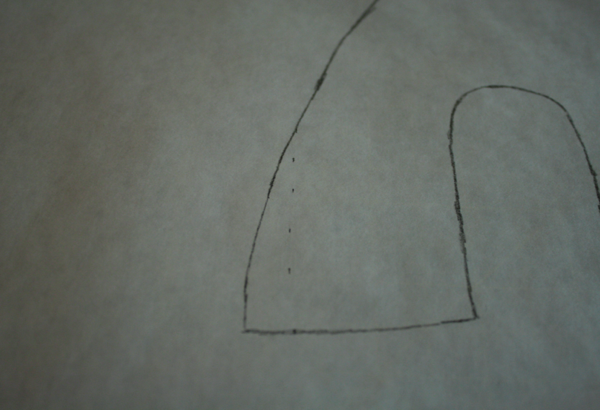 I then connected the dots with a fluid line to the bottom of the shoe. 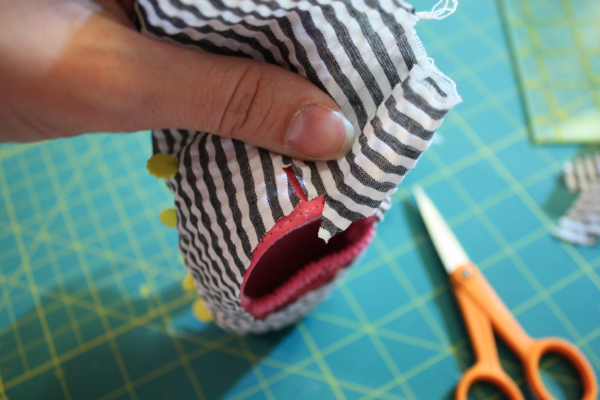 But since I just did this on one side of the shoe, when I cut it out, I folded it in half, matched up the inside edges, and cut away the extra pattern from the opposite side, creating symmetrical sides. 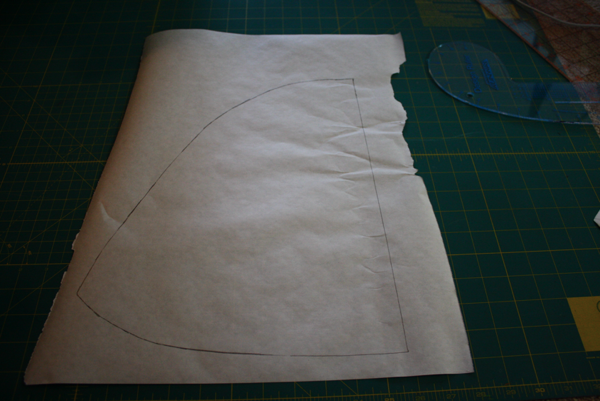 Then I measured the inside of the upper, added 1″, and cut a rectangle that length (I believe it was 9″) by 4″ tall, to create the top of the boot. 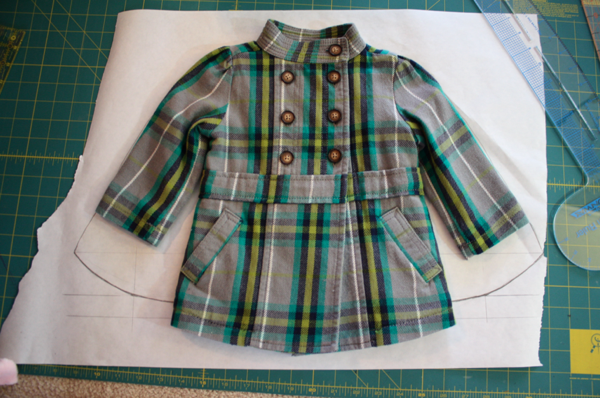 Then to create the cape, I used a 6-12m coat we have (I know, isn’t it ADORABLE?!). 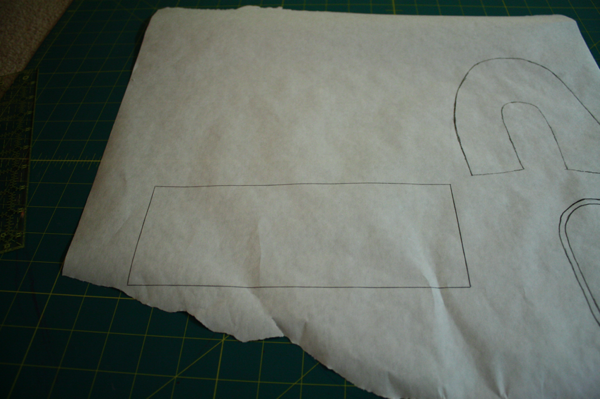 I laid it out flat on a piece of freezer paper. Back to the pattern. (she wrinkled the freezer paper crawling over it, so I’m sorry it’s hard to see that top right part) Draw a line from the start of the collar to the bottom of the sleeve on each side. 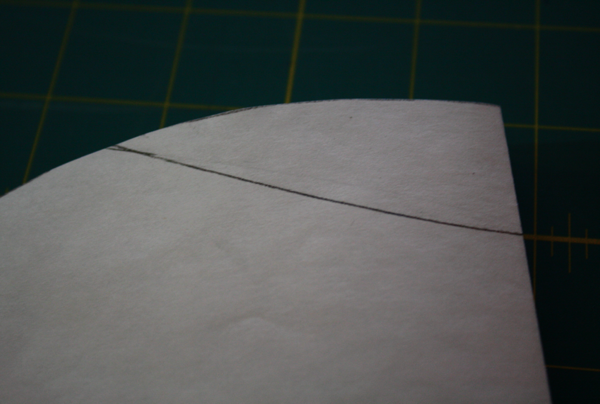 Then draw a line straight across the bottom. 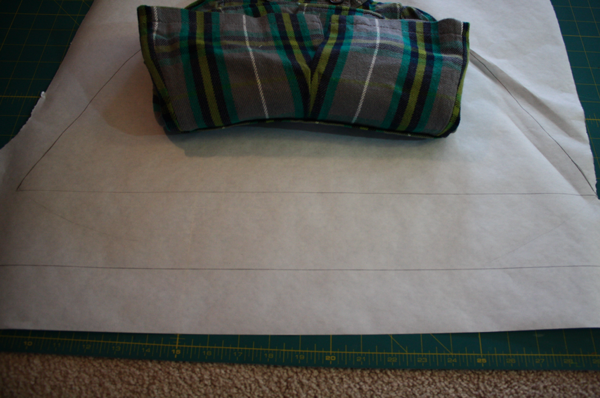 Now, the rest of these measurements are the one’s I used for a 12m size cape. 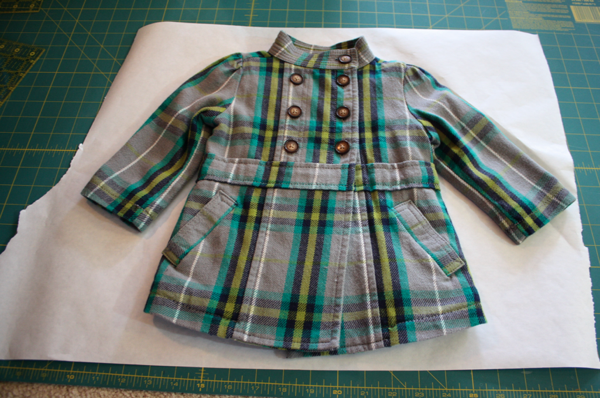 It’s still a little big on her, and will probably fit through 24m size, but you might need to figure out your own measurements if making a bigger or smaller size. 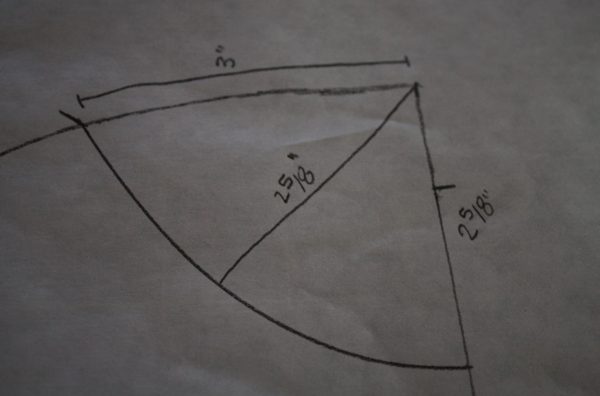 Then another one 1″ above the line I just drew. 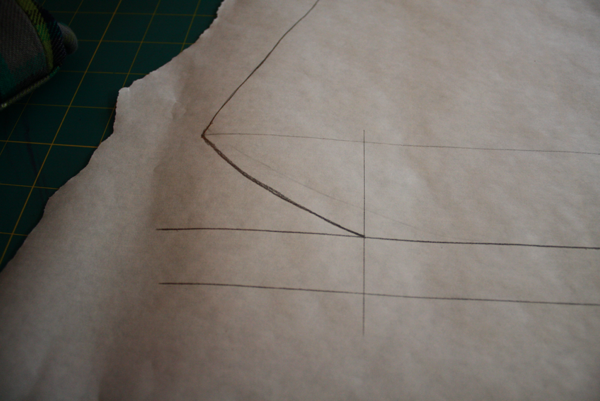 Then I drew a vertical line 2″ from the edge on each side. 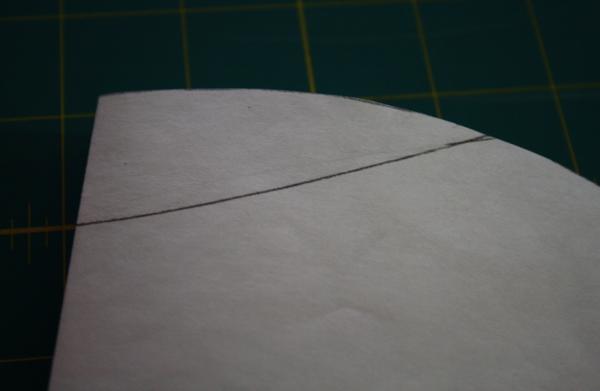 Using a curved edge, or freehand if you’re really good, draw a curved line from the outer corner to the intersection of the first 2 lines. Repeat on the other side. 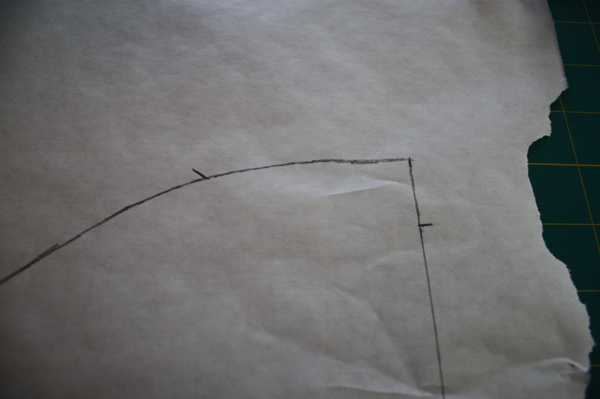 Then draw a line connecting the two, arcing down to right above the lower line. 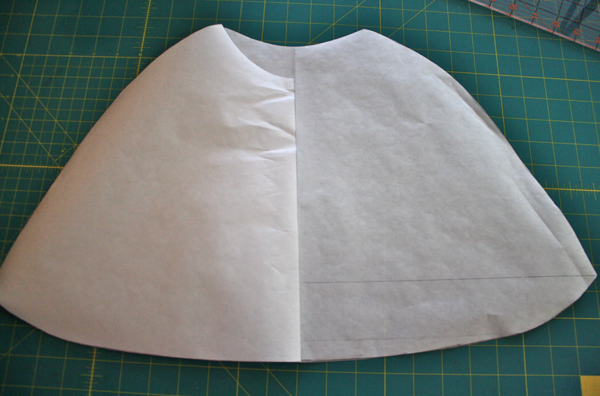 Here’s an idea of the shape of the cape versus the shape of the coat I used to make it. 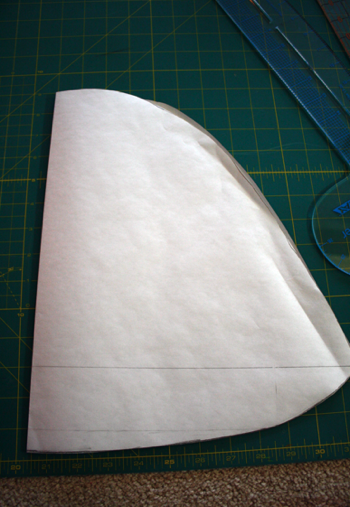 Then cut out your cape piece on the lines you drew. 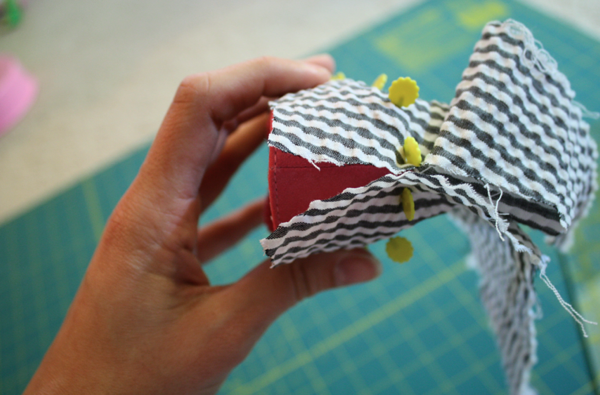 Fold it in half and make the sides symmetrical, just as you did with the shoes. 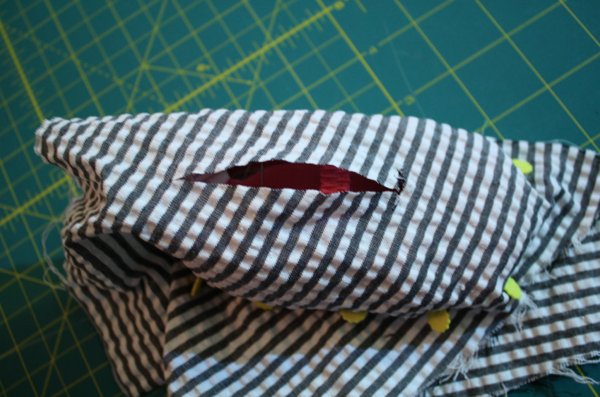 Keeping your piece folded in half, trace around it on a separate piece of freezer paper to make a pattern piece for the front of the cape. The neck of the cape needs to have a scoop shape to it, so working with the full back piece first, keeping it folded in half, I measured 1″ down the straight folded middle edge, and 3″ out towards the shoulder, then connect them with a curved line. 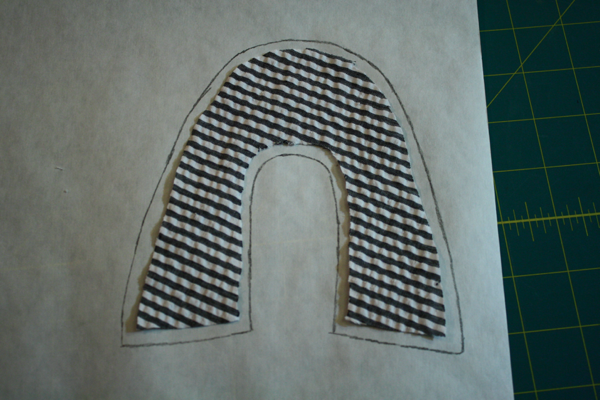 I transferred the markings to the front pattern piece to have a reference point. 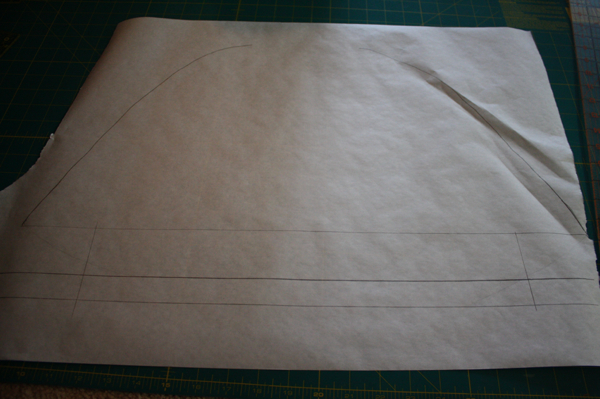 Then I made that curve deeper, using the measurements I marked, making sure to use the same point on the curved shoulder so the front and back pieces will match up perfectly. 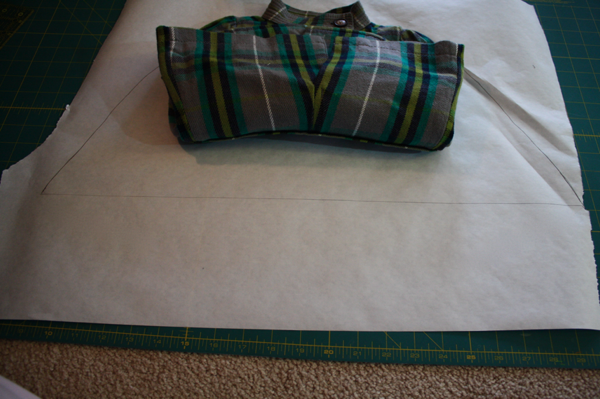 Then cut out on your markings, and you have your cape pattern pieces! Thank you so much for posting this. 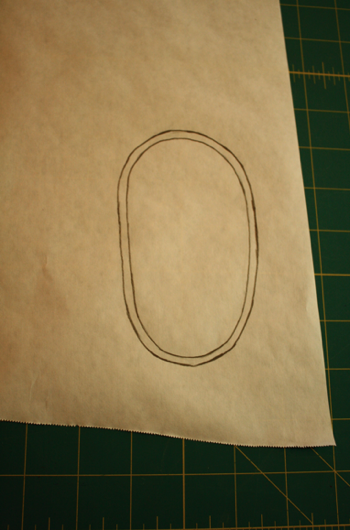 I was trawling the internet for days on how to make a cape (for an Anna from Frozen costume), and nothing worked. Found your tutorial today and I am almost finished! Thank you again, excellent tutorial. I loved this tut! I made my daughter a cape with it.